Sunday saw the conditions lay down a bit from the winds we saw Saturday and we were back out on the ocean sailing under overcast skies and 10-15 knot winds in rather large and lumpy swells. I made it out to the race course, but felt absolutely awful out there as we waited to get racing started. After being so uncomfortable out there I left before the first race and would get an early start on the trip back home. I would later figure out that the breakfast bars I had been eating hadn’t been agreeing with me and had actually been making me feel bad all weekend. Make that a lesson for next time. Even though I didn’t get as much sailing as I might have wanted, it was still nice to enjoy some warm weather, see some old friends and get away for a bit. 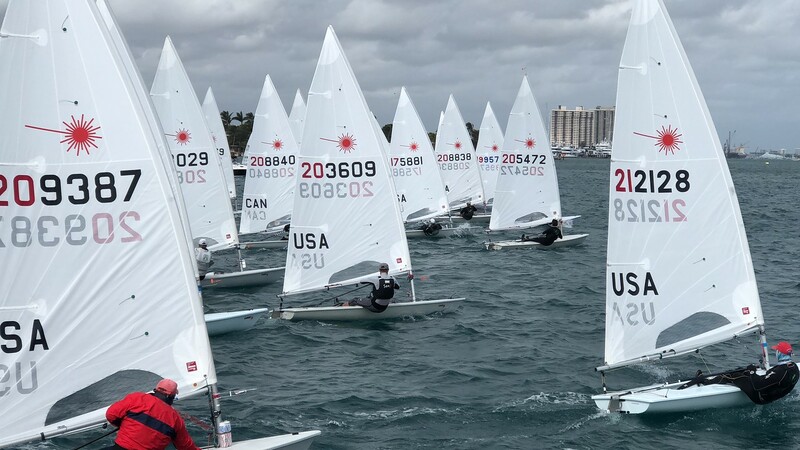 I am looking forward to more sailing in a few months when it warms up in VA.
After postponing on shore in what was looking to be some gnarly winds, the race committee took everyone out to the harbor for some short course racing in an alternate format. I made the decision to bail on the day and jump on the committee boat for a front row seat. 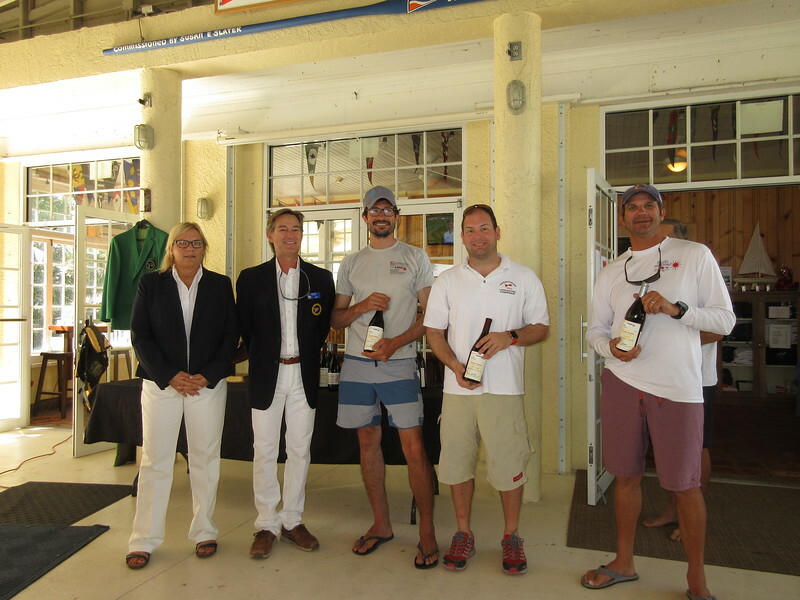 The alternate format meant todays races only counted as one race in the regatta. In the end it wasn’t as bad as it felt on land or was predicted and I was a bit bummed to skip sailing it. 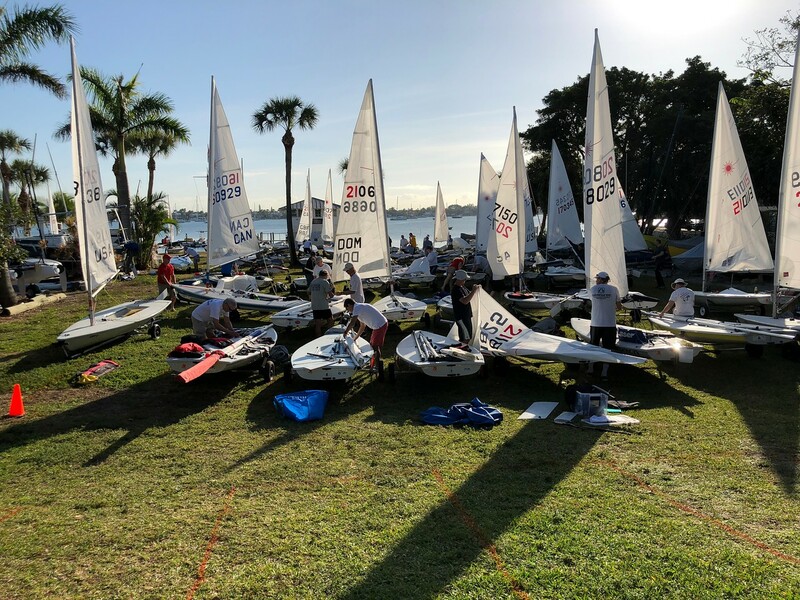 The first day of the Florida Masters was a nice one with temps in the 70s, partly cloudy skies and 86 boats in two fleets. We sailed outside in the ocean. The wind started around 7 or 8 out of the WNW and shifted around to NNE and built to 11-13. 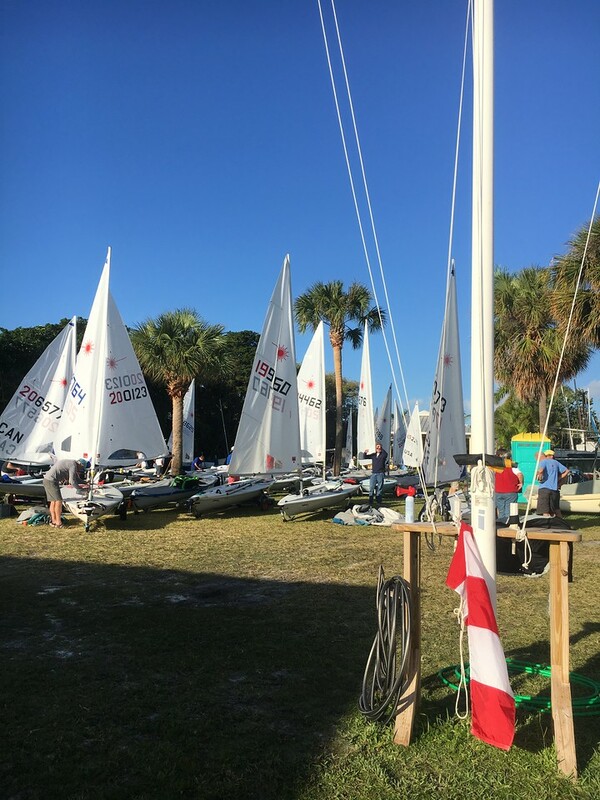 We got in 3 races for both fleets with the radials starting under the prep flag and the standards starting under U-flag after general recalling twice each of the 3 races. In the first race it was lighter and a little lumpier and I picked the wrong side of the course on the first beat and found myself pretty deep at the first mark. By the second leg the wind had shifted much more north making it a parade upwind and down. I topped it off by hitting the same leeward mark both times I went around it and settled for 21st place finish. 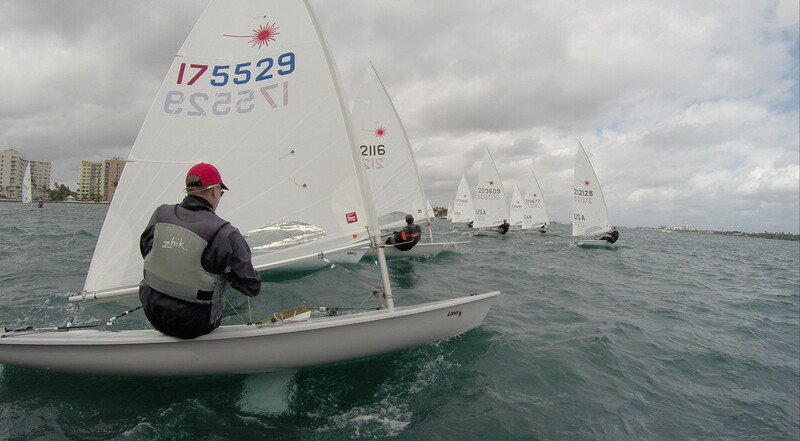 After moving the course west and orienting it with the wind out of the North we got our 2nd race started. I was mid-line and had a great start and legged out to the left. I got to the layline and sailed right in to the mark and found myself first around. 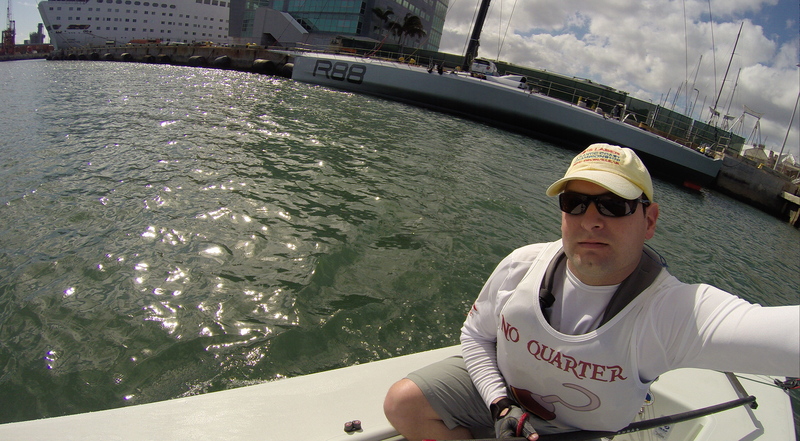 I lost a couple boats on both downwind legs and settled for an 8. 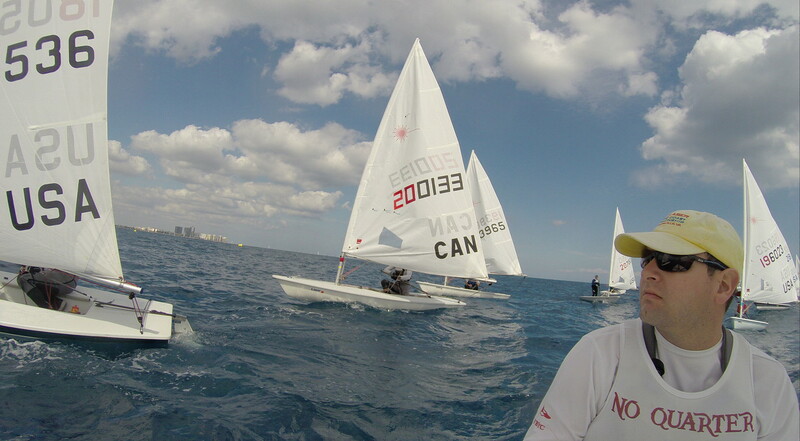 For the 3rd race I started closer to the pin and had to pinch above a few boats barely laying it. I stayed to the left of the course and by now the wind was 11-13 – requiring some sitting out and occasional hiking. I was making the boat move well upwind and even started figuring out how to work the waves downwind so I didn’t loose boats. I finished 5th and after 3 races I’m first Apprentice Master and 14th overall in the Radial fleet. The trip to West Palm Beach went pretty smoothly for a 850mi journey with only 1 brief slowdown for construction traffic. 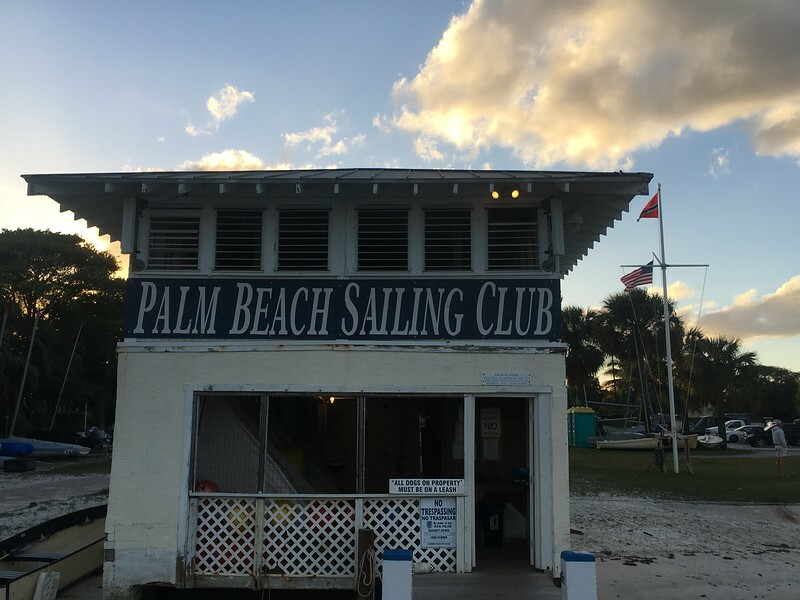 I spent the night in Jacksonville Florida and finished the trip this morning arriving at Palm Beach Sailing Club around 12:30. The forecast for this week is going to be for quite a bit of wind on two of the days. Having not sailed much in the last year and not at all since October, I’ve opted to join the radial fleet this weekend. After unpacking I went out to practice in 10-11 knots out of the east, mostly sunny skies and temperatures in the low 70s. I got out into the bay and the wind current was ripping, so I sailed around the harbor and got used to the Radial again. In the distance I spotted Rambler 88 and sailed by it. 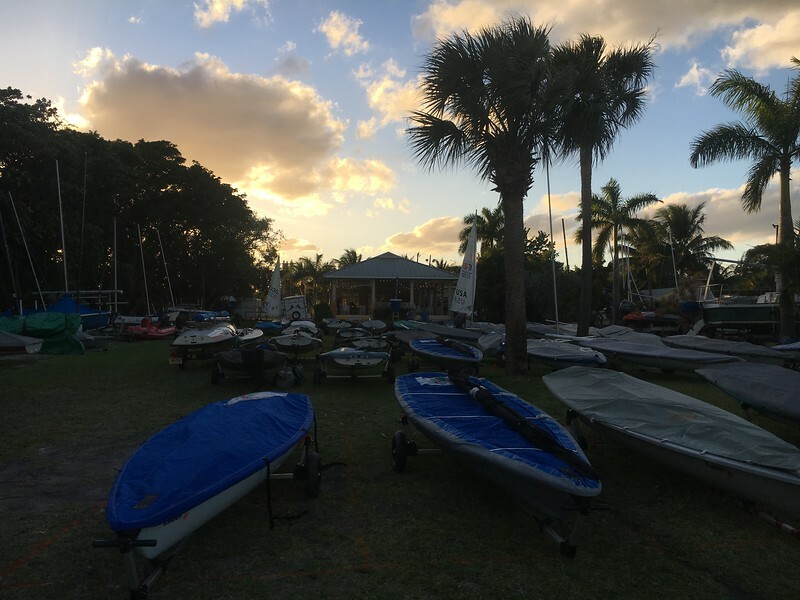 The boats were put away, I went for a run and ready to camp out at the club and go racing tomorrow in a 30+ boat Radial fleet. There would be no wind on Sunday and after postponing onshore for a little over an hour the days racing was called off and results were final. It was a light air day at the Florida Masters with temperatures in the mid 70’s and wind out of the south at 5-10. I did a quick video of the grounds while people were rigging seen here. 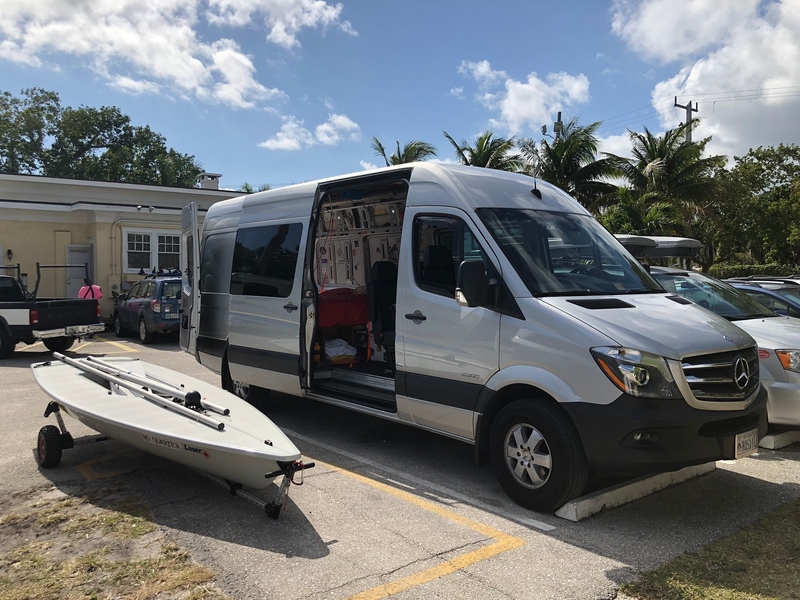 I also admired some of the other travel setups including some enclosed trailers and another sprinter van set up as an RV with the boat riding on the (low) roof. 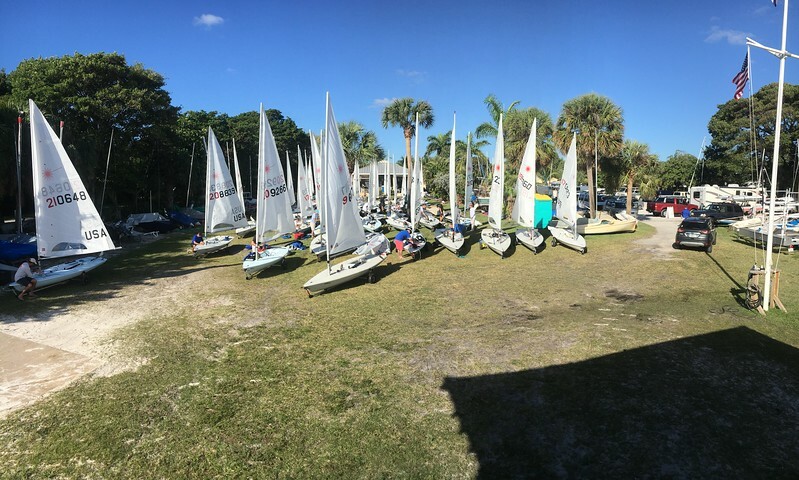 46 standards and 19 radial launched and sailed south to the inlet and out onto the ocean. There were some large swells at time and when you were at the bottom – there were times you couldn’t see the tops of the sailboats at bottom of the other side of the swell. The lumpy conditions, wind swinging 50 degrees and the current pushing us down the course made for some challenging racing. In the first race I had an ok start down by the boat and made my way out to the right side of the course. I hadn’t quite figured out how to make the boat go in the lumps and found myself midfleet at the top mark. At the bottom mark we had a course change to shorten the course and this time I banged the left side of the course mostly to get in clear air. It worked out great and I was 7th at the top mark and I held that to the finish. In the second race I started mid-line and this time worked my way all the way out to the left. I caught up to the Radials who started 7 minutes ahead of us and rounded 5th or 6th. Downwind I played the right side of the course and was 2nd around the right gate and again decided to go out to the left. With the wind down a little bit and maybe a little more current further from shore on the left – it didn’t pay for me and I dropped 10 spots to the folks who played the right more and finished 12 at the shortened upwind finish. 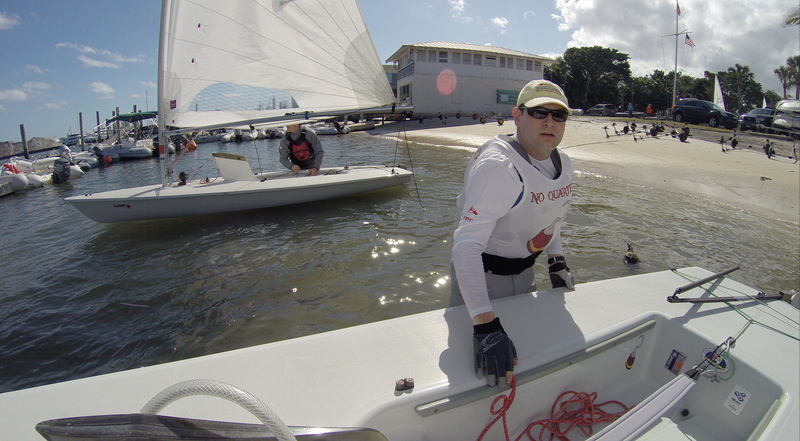 In the 3rd race I had an atrocious start and had nothing but bad air anywhere I looked upwind. I think I was ahead of only a few boats at the top mark. Downwind I played the right side of the course, caught some puffs and passed quite a few boats. Upwind I played the middle right and passed another 10+ boats. 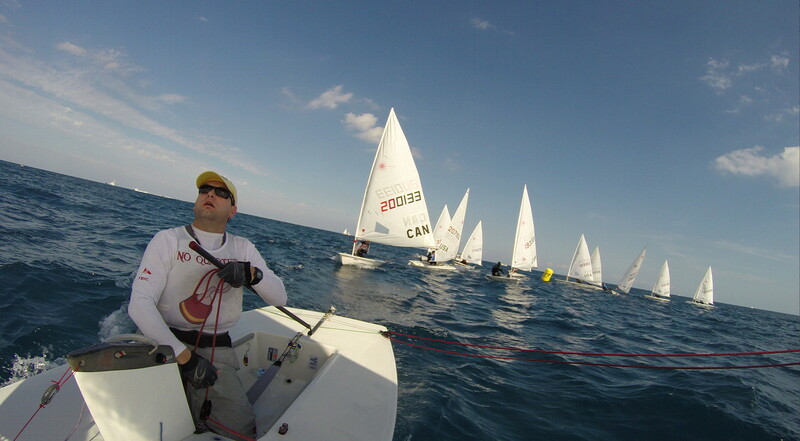 On the final downwind I passed another boat to finish 20th. 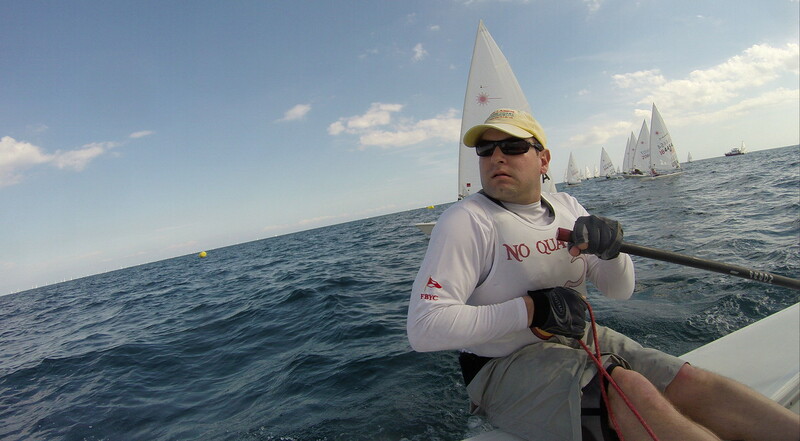 I was happy with my sailing that I was having good speed especially upwind. I just need to get a little more consistent and work on starting to start out in a good position. After 3 races I’m in 12th overall and 2nd Apprentice. A couple general observations – I was sailing with the Mk2 sail and in the light and lumpy conditions I found the looser outhaul gave me better pointing and power through the waves upwind. Today also highlighted for me how important it was to have clear lanes of wind. As big as the swells were – they blocked the wind – so it seemed as if only the top of the sail was always in the wind and so it made an even bigger difference without a clear lane of wind. Following racing I did a quick run down the river front and cleaned up for a nice dinner at the club. 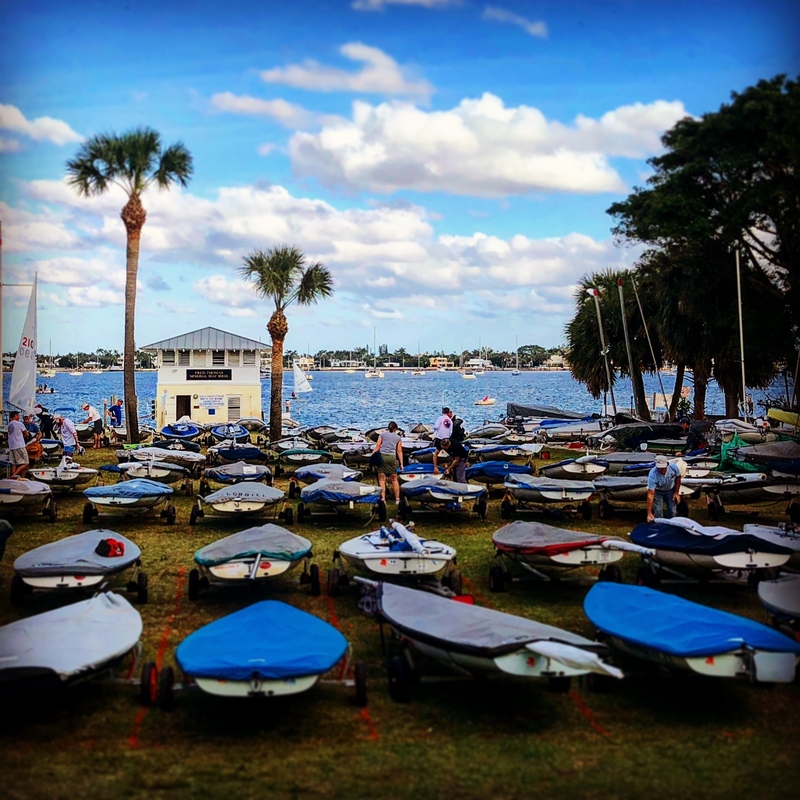 I’ve arrived in West Palm Beach for my first Laser Masters Regatta. 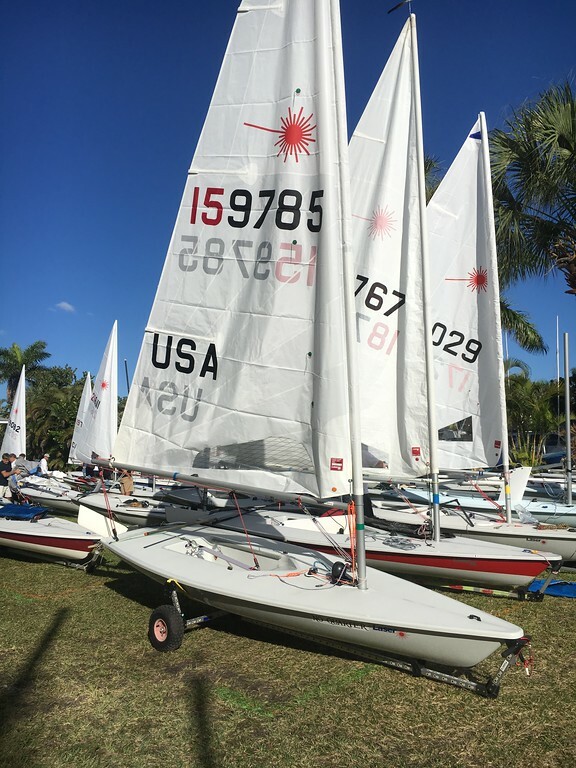 I finally qualify (35 years old) and I am looking forward to the next 2 days of sailing at Palm Beach Sailing Club followed by a day off and another 2 days of sailing the Masters Midweek Madness regatta at Sarasota Sailing Squadron. It took about 13 1/2 hours of driving to get here from Richmond having left late yesterday afternoon and spent the night in Manning SC. 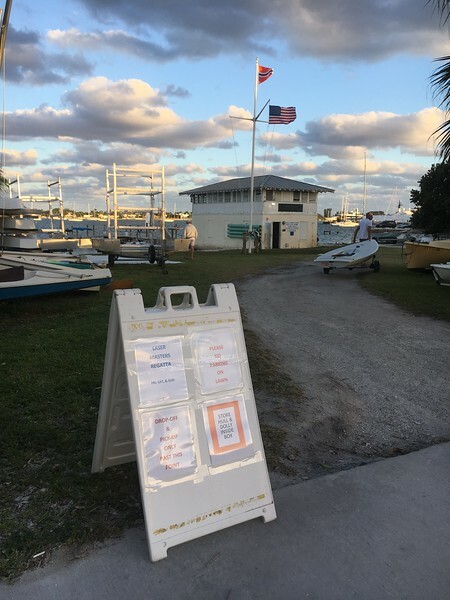 Palm Beach Sailing Club is located on the sound just a short sail from an inlet and the racing area will be out on the bay. They have beach and ramp launching with a small dock and a clubhouse with a big pavillion. I met up with some familiar NJ and MD friends and also ran into some far-flung sailors I’ve met at various regattas. Racing starts tomorrow with temperatures in the high 70s and winds 10-14 out of the east. Can’t wait!